A classic one size fits all swim cap, but with a funky design! This silicone cap forms provides a smooth surface for less drag through the water and to protect your hair. 1. Insert both hands flat into the cap. 2. Curve your hands to stretch the cap outwards. 3. Make sure you stretch the cap outwards, rather than upwards (upwards risks splitting the cap). 4. Then put the cap on your head. Googles etc should be worn on the outside of the cap. 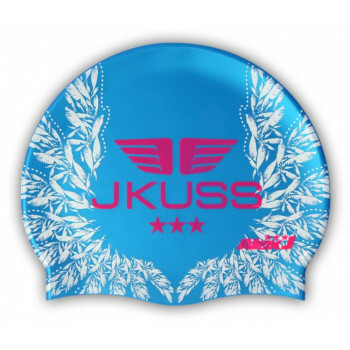 A white silicone swimming cap with a red JKUSS logo ..
A red silicone swimming cap with a yellow JKUSS logo ..
A black silicone swimming cap with a gold JKUSS logo ..
A navy silicone swimming cap with a yellow JKUSS logo ..